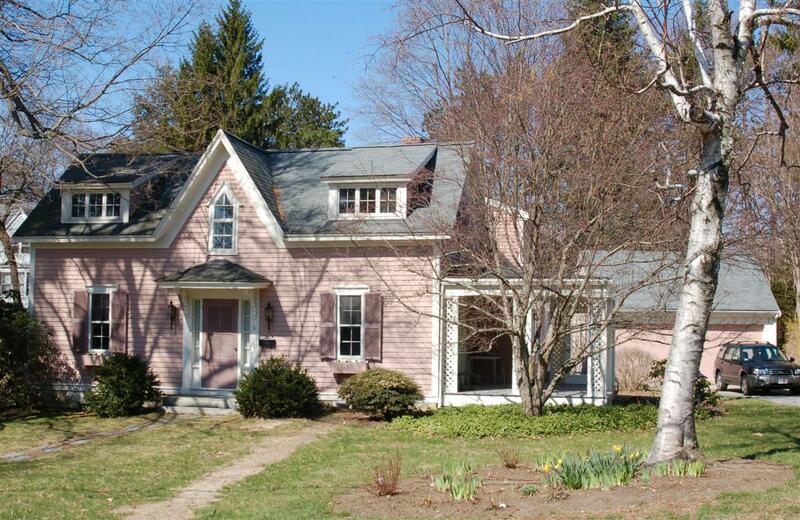 Gothic Revival - Deep pitch on roof and center roof gable, style and dimensions of the main body of the house are consistent with other homes of this period in Andover. The two small roof dormers flank the gable may have been added later. The center window above the main entrance also a Gothic feature. The canopy over the front door is Italianate. Smithshire Estates derived its name from the Peter Smith Estate that was once located at 53 Shawsheen Road. The estate was called "Forest Hill" and was the mansion built by Peter Smith brother of John Smith. They were the founders of the Smith & Dove Manufacturing Co. in Frye Village and moved the operation to Abbott Village in 1843. The former Peter Smith estate “Forest Hill” was once the farm of Elijah J. Herrick in 1821. The 1830 map of Andover lists Herrick on Shawsheen Rd. Elijah was born Nov. 10, 1786, married Hannah Abbot May 9, 1815 and they had ten children. Herrick was a shoe manufacturer and yeoman. Herrick owned property on School and Central Streets and took loans on his five parcels from Ralph W. Jewett of NH, and Samuel Abbott . Herrick would sell to Samuel Abbot on Apr. 4, 1838 and moved to Illinois. Samuel Abbot then sold the farm to Alexander Winning on June 1, 1839 for $3255. The farm included a dwelling house, barn and 26 acres that stretched from Stevens St. to Lincoln St. Alexander Winning was born in 1818 and married on April 25, 1839 to Mary Ann Murray of Charlestown, MA b. June 18, 1808 dau. of John & Mary (Hayes) Murray. They had two daughters; Mary Elizabeth and Martha Caroline. We now believe that this cottage was the Herrick - Winning farmhouse. Winning sold his farm to Peter Smith on April 26, 1847 for $3100 and moved out to Osgood St. The first parcel was 26 acres with dwelling house and other buildings. The second parcel was on the southwest side of the street. The Winning farm would prove a perfect location between the mills and the West Parish Church. It is not known who the architect or builders were for the Forest Hill mansion but it was completed prior to 1850. The Andover Valuation schedule 1850 lists Peter Smith’s; Dwelling house $6500, barn and other building $500, 43½ acre Farm, Farm house, Barn and sheds $3000. = $10,000. Farm stock and Carriage $544, Bank stock $450, Rail Road stock $900 = $1894. Buy 1970 two green houses had been added. The Winning cottage became the house for the estate gardener. The 1850 census lists Mathew Shenider, age 22 from Ireland, a laborer at the estate. The State census of 1855 lists Hugh McNennie age 23 b. Ireland, gardener and Patrick Donnahue b. Ireland age 23 Farmer and laborer. In 1860 Alexander L. Keene age 35, b. Scotland, Gardener, wife Maria age 35, and George A. age 6 and Henry B.. Also Edward Farmer, a farm laborer. 1870 Morton Cummings 30, wife Margaret 30 Gardener, and Joseph Paulin age 22 from Canada the farm laborer. In 1880 the gardener is now George A. Skene age 26 and his wife Martha age 27. Peter Smith died on July 6, 1880 and provided for his wife and children. Peter also set aside funds for maintaining the estate. "Forest Hill" had many out buildings servicing the 28 acre estate. Peter Smith willed all the property to his wife Esther W. with a live tenancy. Upon her death in 1889 the estate went son Peter Dove Smith. Peter Dove Smith would continue his father's legacy when hie moved to Forest Hill in 1890.
in 1900 census Matthew Dallachi, b. Jan. 1862 in Scotland was the gardener. Matthew's wife Emma b. Mar. 1869 in Canada and their two children; Charles A. b. Aug. 1896 and 10 moth old Emma A. b. July 1899 occupy the cottage. Murdock McLeod b. May 1875 in Nova Scotia is the coachman. 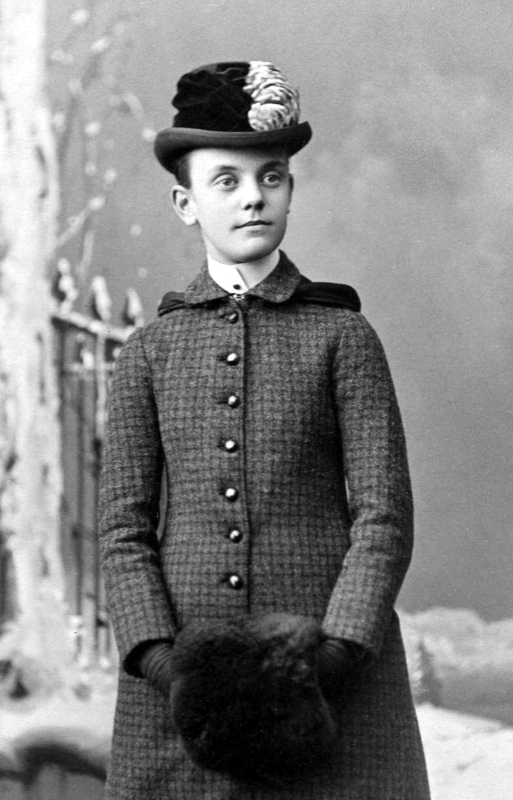 Peter's health declined in Dec. 1910 and he deeded the estate to his wife Abby. Peter D. died Jan 16, 1911. In 1920 John F. Davis age 39, wife Mary A. 39, Frank age 11 and Joseph age 8 are in the gardener's cottage at #63 and were most likely the last on the estate. After the death of Abbie Jane (Chandler) Smith on Aug. 2, 1921, and her sister-in law Susanna Smith on Nov. 1, 1922 the estate went to her three children, Esther Ward Smith b.Nov. 8, 1870, Elizabeth Miller (Smith) Clarke b. Apr. 18, 1876 and Mary (Smith) Churchill. Esther W. Smith was the executrix of her mother's estate and the only sister that had not married. On Feb. 10, 1923 Ester took control of the Smith estate. The Mansion house was too large to continue to maintain and was shuttered closed. The Gardener's cottage on the west end of the estate would become the final home for Esther Ward Smith. Esther was born in Gloucester, MA when here parents were living there. She was an avid hunter and enjoyed shooting game birds. She was the first policewoman in Andover and served on the force for 40 years. Esther was an active member in town affairs and a member of the Andover Garden Club. She was also a member of the West Parish Church. 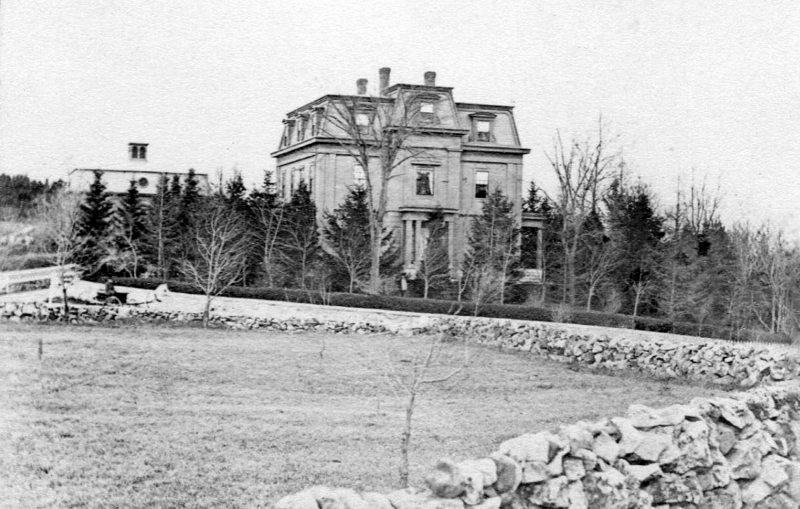 Esther and her sisters sold off the family estate and the mansion house was razed in 1947. Beech Circle is the location of Forest Hill. Two barns were converted in private homes. Ester Ward Smith died on October 15, 1952 at the age of 81y 11m 5d. She is interred at West Parish Garden Cemetery in the Smith family lot. Stephen A. McClellan, attorney, was the executor for Esther's estate. The 26 acre parcel of Forest Hill was then developed into Beech Circle, Lincoln Circle and Smithshire Estates. 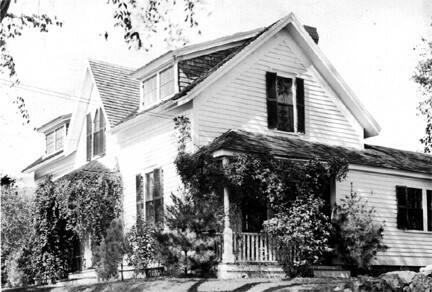 The Herrick - Winning Cottage was moved from 63 Shawsheen Road to the new lot "E" at #6 Smithshire Estate to make way for the new street entrance. Richard C. & Joan A. Simmers became the new owners of the cottage on Dec. 24, 1953 then Jack & Norma L. Edmonson on Oct. 21, 1954. See plan #2792 - Nov. 1953 lot "E"
Major Alterations Moved and remodeled 1954 - Formerly 63 Shawsheen Rd. 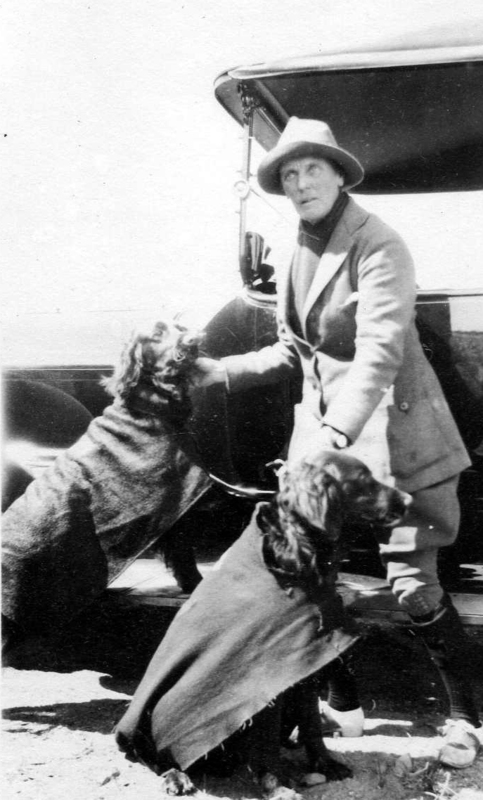 Esther W. Smith with hunting dogs.